An Englishman in Colombia: Work Rest and Play...Not Necessarily in That Order! Work Rest and Play...Not Necessarily in That Order! I started this morning with a trip to Copacabana to get the week-end food in, and the chaos continues as people ready themselves to start the Festival of Oranges this afternoon and all week-end. 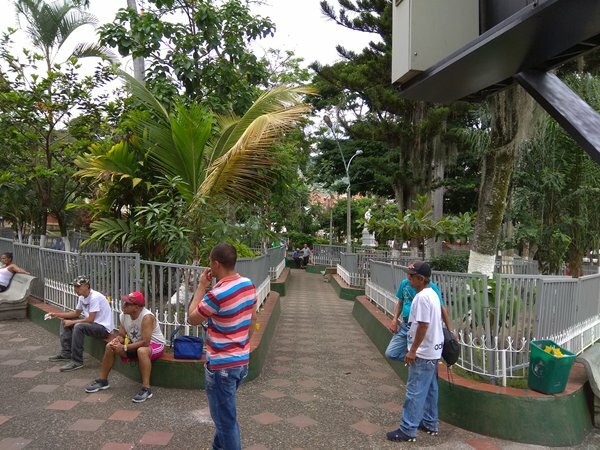 When the town hall believes it has to put barricades around all the gardens in the Park, to stop people walking on them, on sprawling on them once drunk, or using them as toilets, it doesn't say a lot for the organisation of the Event. I can't understand why they don't use one of the Sporting venues in the town to host the event, and let business in the town continue as normal, to barricade all the flower beds must have cost a fortune. 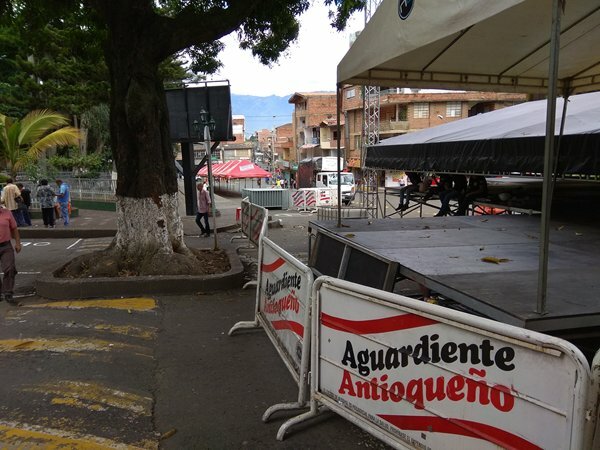 The stage is set for the concerts, as always blocking the main thoroughfare, and booze tents erected. That's it now, I will not be returning until Monday. From here, I went on to Niquia (Bello), I wanted to buy another 5 gallons of white paint, to continue my decorating, my existing tub, has some skin dispersed in the paint, so I will use that outside and the new tub inside, I could have bought it in Copacabana, but it was an excuse for a potter around Homecenter (our B&Q), also to go for a coffee and a slice of cake, I usually have Maria Louisa (sounds posh doesn't it? it's just a version of Victoria sponge!) but they only had one slice left, and it didn't look that inviting, so she suggested I tried the carrot cake, it was delicious. Having had my fill of poking around, which doesn't take too long, I headed back, stopping off for brunch on the way, and ended up having a long conversation with the owner of the Restaurant, I know him, because we had a run in, when he was financing the café alongside us, before it became the Barbers, however we 'made up', and usually just pass the time of day, but for some reason today he wanted to chat. It turned out that ten years ago he spent some time living in the UK, in Brighton, his English is very good for someone who doesn't use it every day, you would have laughed, because he was speaking in English, and I was replying in Spanish, he turned out to be an interesting man, and he has promised to help us out over our local problems, apparently one of his friends is a bigwig in the Police, and over our local Police Captain, whether he will, remains to be seen, but he seemed genuine enough. 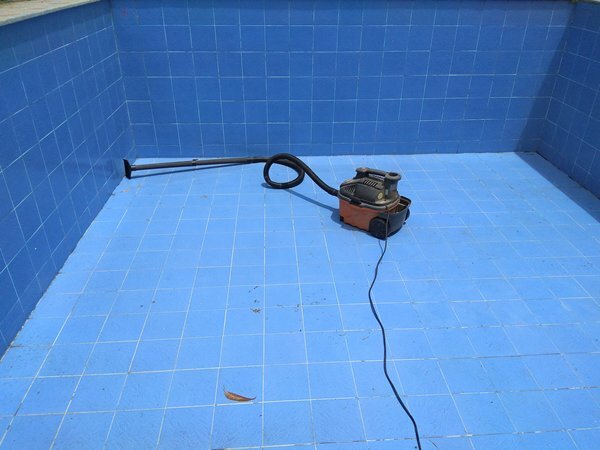 Back home, it was time for some work, we had a tropical storm last night, and there was obviously water in the pool, I had no intention of mopping all afternoon, so out came the hoover. I hasten to add, my workshop Vac, and it sucked up the water in no time, for the time being this will be our means of drying out the pool, albeit, I am still thinking of removing four floor tiles, breaking through the concrete and installing a sump pump, but that is more cost, and until we know what I am going to have to pay to the Tax man, I am not committing to any more projects. The Swimming pool project is under review at the moment, it was my intention to roof it and turn it into Marcela's Gym, but I sat staring at it last night, and thought the garden will be full of nothing but roofs, the Gazebo, the Garage, the Workshop, and the house, the only other option is to build a roof for it, then dismantle the existing Gazebo, and use that as an open patio, but again that is for consideration, as Marcela says, we spent a fortune rebuilding the Gazebo only two years ago, why destroy it? If only Pedro had installed drainage on the pool, it would not be a problem, but with no drainage, it is a pain, and I don't want to remove the pool altogether, because it would devalue the property. Now it's time to put my feet up...again!